Scott Jennings had two goals when he decided to open a restaurant after graduating from Arizona State University 15 years ago. First, he wanted a place that didn't feel corporate and would make employees happy. Second, he wanted something unique. "I'd worked in a lot of places in college, and everything was the same," Jennings says. "I wanted to shake things up." His solution? A marijuana-theme sandwich shop called Cheba Hut. While sandwiches and stoners fit together like ... well, sandwiches and stoners, building a franchise empire around the theme seemed like a long shot. But Jennings is killing it. 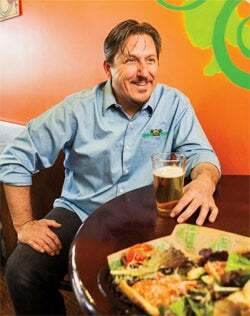 He has opened 16 Cheba Huts in Colorado, Arizona, California, Oregon, New Mexico, Wisconsin and Iowa--mainly in college towns--and chalked up $10 million in sales last year from "toasted" subs named after varieties of pot. "People underestimate us," he says. "But we are dead serious about what we know--serving up good food in a place with a great experience." You've been around for 15 years; there must be something beyond the gimmick. We win our customers over one person at a time. I think that's why we're still in business--we're not faking it. People come back for the food. Some drive hours and have us pack sandwiches in dry ice so they can take them home. We're serious about our food, our sauces and our flavor profiles. That's our differentiating factor. We're more about the interaction than the cash transaction. We want to interact with customers and have some fun. That's a hard question. It does differentiate us. I didn't do it as a gimmick; it's more of a parody of marijuana culture. But as far as growth, it's a limiting factor. It makes it hard to find good franchisees. But it has helped us focus on why we're here. We want our customers to have an experience. They can fill their bellies with rice at some other place, but I want them to feel better when they leave our store. Die-hard fans like to bring people in, so we always have to be on top of our game. How is your food different from that at other sandwich chains? Our employees really have to know our flavor profiles, and we train them to give recommendations. We have things like jalapeño cream cheese and house-made barbecue sauce. These are flavor profiles you're not going to get anywhere else. Like our Italian--it's a sandwich that everybody has, but we have real prosciutto on ours. I think that's the only way it should be served. And each store has a secret stash, where we let the franchisees try out their own sandwich recipes. What type of franchisees do you look for? We don't want to deal with the type who just wants to throw money at us. You know there's a lot of money out there, but not a lot of cool money. Most people with money just want to make more money. Absentee franchisees are fine, but they still have to care about the experience. A lot of people see the weed thing and they're out. But you don't have to smoke weed to own or eat at a Cheba Hut. We're realists, not activists. I'm more interested in freedom of speech. I can call my sandwiches whatever I want, and if you say no to me we're going to have issues. I believe in legalization or decriminalization. Lots of lives have been ruined over this, and it's not a joking matter.